Probably the first thing that comes to mind when someone mentions arc flash is a guy dressed in a moon suit holding a six-foot-long orange rod or you picture something like a scene out of the 2008 movie The Hurt Locker. What you are picturing is a perfectly acceptable protective measure to take to protect yourself from an arc flash, but it falls under the category of personal protective equipment… which should be your last line of defense. Before you decide that PPE is the only suitable means of protection (for both shock and arc flash hazards) there are some other ideas and concepts that you need to consider. The goal should be to successfully accomplish whatever it is you are trying to accomplish without having to wear PPE at all. Ranking these in order of the most effective to the least effective ways to protect yourself we begin with elimination and substitution, engineering controls, increase awareness, introduce administrative controls, and finally wear personal protective equipment. For some of these ideas it won’t be practical to use them the day you are going to do your job because, well, they might not exist or be in place yet. But it’s important that we go through them so you understand the concept and when you are out at that job you can look at it through a different set of lenses. Maybe even thinking that “Hey, in three months when we come back to do this job again, we could have this widget in place and we are going to be a lot safer”. Let’s go through each of them in a bit more detail. Elimination and substitution are the best ways to deal with electrical hazards but often they are not a choice. Typically, the reason you are faced with an electrical hazard is because it is feeding energy to an important part of your process, whether it be a motor or even the lights in the building. I’m not trying to discourage you from trying to find a solution but the truth is electricians are going to have to work with electricity and be faced with electrical hazards. Sometimes you will run into areas that are particularly high risk and these are the ones you are going to want to consider eliminating altogether or substituting where the work takes place. So, for instance, you could do your switching in a safer area of the facility but maybe you are compromising by having more equipment go offline. A lot of jobs can be completed with the power off. Maybe you need to rewire a starter bucket. There is no need to do this energized, so, you can eliminate the hazard by following the process to establish an electrically safe work condition. 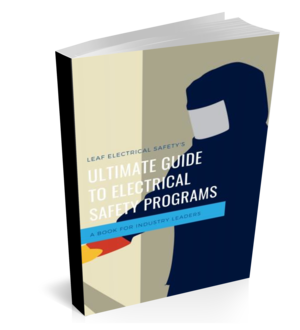 The catch is that you are faced with the hazards of shock and arc flash while you are completing this process! So, elimination is a difficult one but if you can pull it off then it`s your best option. Engineering controls are put in place to make a situation safer than it was before. Machine guarding is one that probably most people are familiar with. We haven’t eliminated or substituted the hazard but we’ve made it more difficult for you to be exposed to that hazard. An example often used in electrical systems would be light sensing relays which detect an arc flash faster than normal therefore reducing the time you are exposed to the arc flash energy. Awareness devices are signs, visual alarms and audible alarms that help bring attention to a potential hazard. If something like this hasn’t already been put into place, then it’s not much help to you. But once you are familiar with a task and its associated hazards, think about those coming behind you and make sure the warnings are in place for them. Procedure and training fall under administrative controls. Let’s say that you’ve been assigned to do a task that you’ve never done before. The first thing you should ask is “is there any training for this” and “is there a procedure to follow”? If the answer is no and no, then do it yourself. Find somebody who knows how to do the job, take as much time as necessary and sit down to write out what you need to do. Ask them how to do it, are there any special tools required, any precautions to take, and so on. Finally, we get to personal protective equipment and tools. This is where we have exhausted all other ways to protect ourselves from the hazards and we absolutely must work on or near exposed energized conductors or perform a task that is considered not normal. You are going to have to put on your shock and arc flash PPE and select any of the appropriate tools required to complete the task. As you can see there are several ways to protect yourself from electrical hazards and to be honest you should be trying to use as many of them as you can. Picture each method as a slice of swiss cheese. On their own, each piece of cheese has holes in it, and these holes are when incidents can happen. But, if you stack them up chances are that the holes on each slice will not line up, the more you stack the more likely you`ve covered every hole, therefore giving yourself a better chance at going home safely.